I frequently need to mark circles, either on freezer paper, fusible web, or directly on fabric. 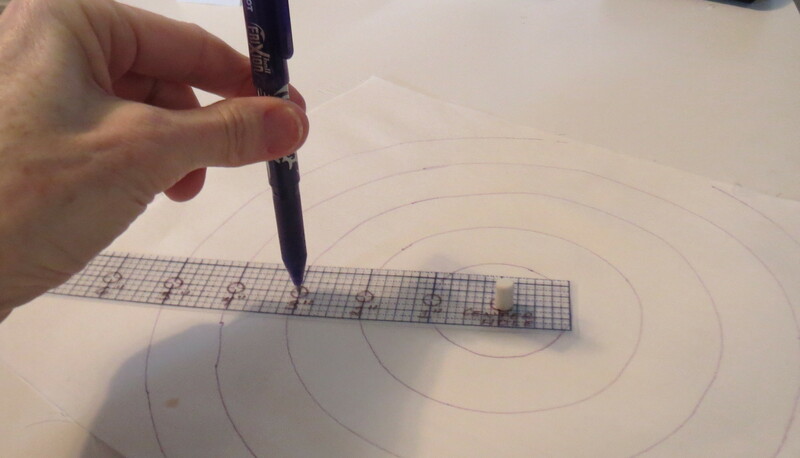 I have a couple of circle marking drafting tools that usually meet my needs. 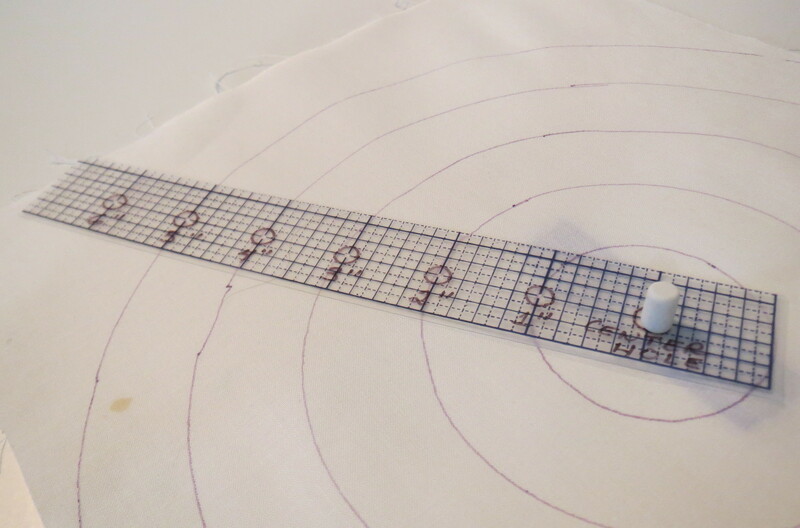 Recently I had the students in my beginning machine quilting class marking concentric circles as a quilting pattern. I only had one large circle template with me and it was a little confusing to use (hard to see what circles on it were the right ones). A compass could be used but I always have trouble getting them adjusted to the right radius – and by the time I have gotten around the whole circle, the compass has slipped and my circle ends don’t match up. I have been thinking about how to solve this problem when the solution suddenly came to me today. 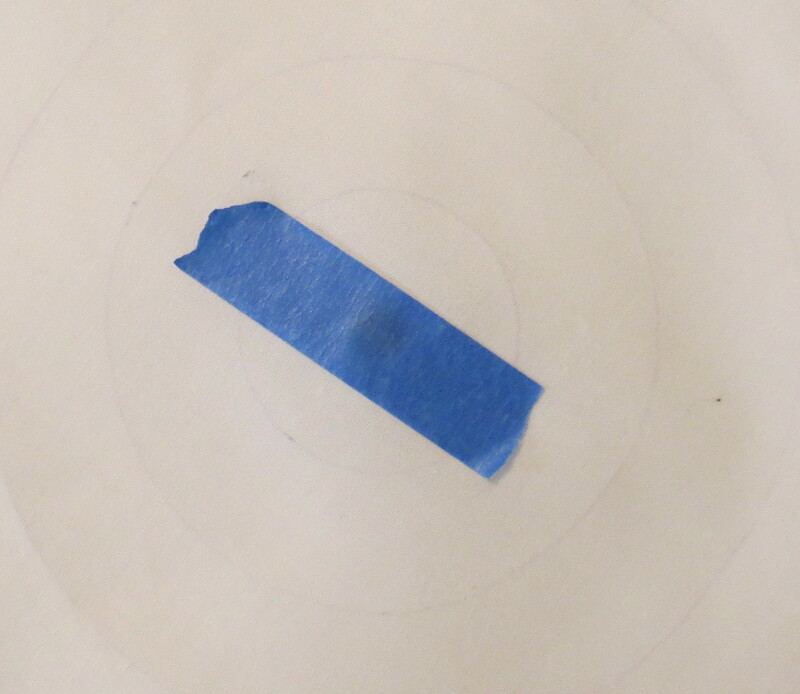 Fortunately I had everything to make this at home, so in ten minutes I had a great circle marking tool! The supplies needed are: template plastic (I used gridded, but plain will also work), a 1/16th inch hole punch, a thumbtack, an old pencil eraser, and a marking pen with a fine point like a Frixion (for temporary marks) or an ultrafine Sharpie (for permanent marks). You will also need to cut your template plastic with your rotary cutter or scissors, and a short piece of tape. The size of your template is up to you; I cut a piece of template plastic about 1 inch wide and 8 inches long. Then I used the hole punch to make holes every inch. I used a Sharpie to draw a circle around each hole so I could see them easier, and also to mark the dimensions. At the top of the photo you can see the eraser I will be using later. The eraser came out of a supply of eraser refills I have for a mechanical pencil, but you can probably find something else to do the job if you don’t have one. 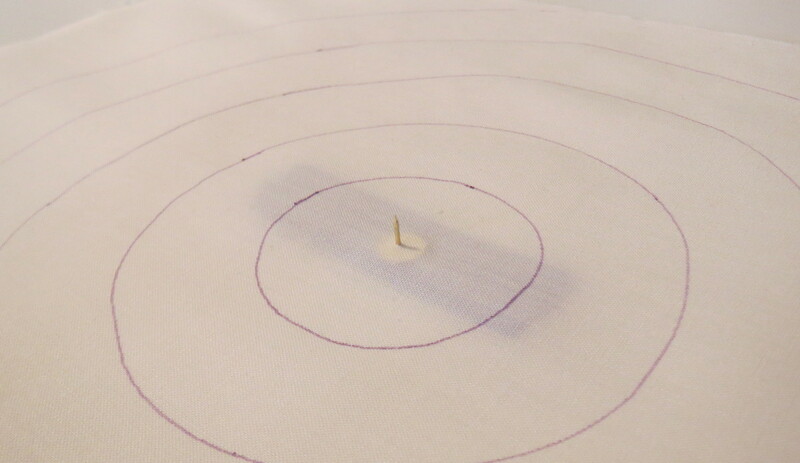 Then I put a small thumbtack through my fabric at the center of my circles, from the back. After mounting the thumbtack, I taped it in place as shown in the second photo. And the marking template mounted on top of the thumbtack, with the eraser put on top to hold the template down. 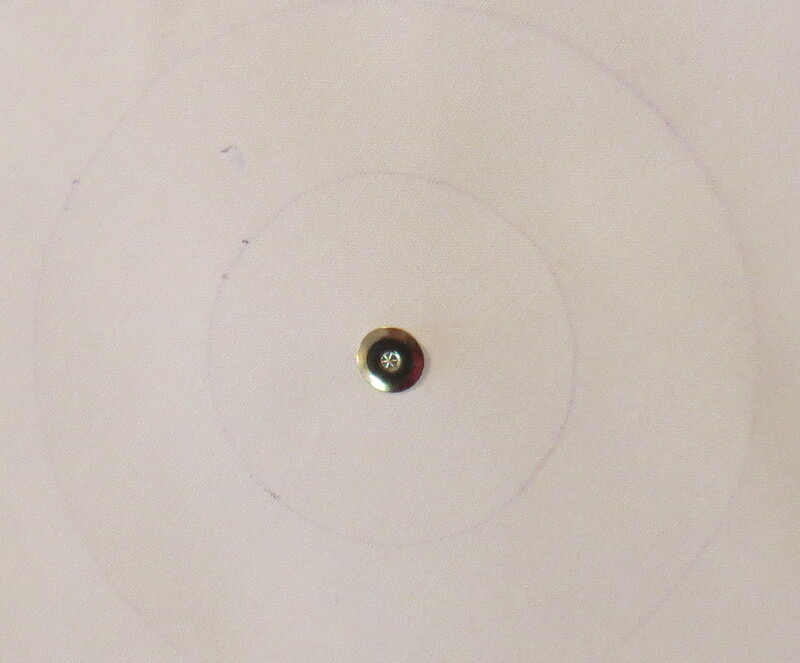 Then insert the pen point through one of the other holes for the size circle you want, and carefully draw the circle. Make sure the fabric stays flat. If you were concerned about the fabric moving, you can use a gripping mat such as a Good Grip or iron the fabric to freezer paper or Totally Stable on the back side before you start. Probably you don’t need any of that if you just mark carefully and slowly. This entry was posted in Quilting, Template plastic tools and tagged circle marking template, circle marking tool, marking circles on fabric, template plastic circle marking tool on March 7, 2014 by Shirley at Mystery Bay Quilt Design. Shirley — How ingenious. I must make one right away. When I was following along I wondered how you would anchor it down and was surprised. You are brilliant AGAIN!!! Thanks. Thanks, Anne. I also was amazed how simple it turned out to be, once I decided to make it and thought about what was needed. Hope it works for you as well. Hi Shirley! All of us REALLY ENJOYED your class on Saturday. This little tool was so helpful. I’ve gathered the supplies to make more at home! I’m working on my “muscle memory” for the next class. Thank you again for your ingenuity, skill and patience while teaching a class where we all had differing levels of competence and ability. Thank you so much, Linda. That WAS a terrific class on Saturday. Enthusiastic, motivated students make such a difference! I thoroughly enjoyed teaching it, and look forward to seeing several of you in my upcoming classes.